Eddie: Hey, I don't own Big Spender. Jake: Maybe not. But he's still your horse. Eddie: He's my friend, Jake. He's my best friend. Big Spender is all about second chances. This made-for-cable movie, produced by Animal Planet, chronicles the rehabilitation of both a neglected, broken down horse and the studly convict who nurses him back to championship form. But while screenwriter Jayne Martin was passing out fresh starts to her characters, it's too bad she couldn't give herself a second chance to inject more emotion and depth into what is purely a run-of-the-mill family film. There's nothing particularly wrong with Big Spender; it just doesn't possess any flair to distinguish it from other wholesome movies. Part of the problem lies with its chiseled, blown-dried star Casper Van Dien, who plays irresponsible Eddie Burton, an inmate serving time at a fictional prison for a slew of oblique offenses. Eddie's doting grandma and motherly warden dismiss him as merely an adorable screw-up, and who are we to argue? After all, his nice-guy demeanor and impeccable grooming (even his perennial five o'clock shadow is always uniformly clipped) make us believe he must have been busted for stealing something innocuous like bubble gum or candy bars, because nobody that good-looking could be guilty of anything worse! Even his love interest in the film echoes the audience's skepticism as she quizzically remarks, "You don't look much like a convict." To help us remember his status (and counterbalance Van Dien's overly earnest portrayal), Eddie wears a shirt emblazoned with the word INMATE on its back throughout the entire film. Based on a true story, Big Spender follows Eddie as he seeks a cushy prison work detail to escape the monotony of peeling potatoes. A fellow convict suggests he join the crew at a struggling local horse farm run by the tough but fair Jake (Graham Green of Dances With Wolves). Eddie pays his dues shoveling manure, but soon grows attached to the sickly Big Spender, a once promising racehorse victimized by an abusive owner. As he nurtures the animal, he gains simple satisfaction out of caring unselfishly for another, and learns how hard work can pay big dividends. Not exactly earth-shaking messages, but ones certainly worth reinforcing. Unfortunately, the film presents them in such a pedestrian, predictable manner they sacrifice any impact potential and become saccharine and trite instead. You can't blame Van Dien for his pretty-boy puss, only the producers for casting him. As an actor, he's satisfactory at best, never bringing to his role the dimensionality it craves. His one-note portrayal quickly wears thin, and because he appears in almost every scene, there's little chance of escaping it. 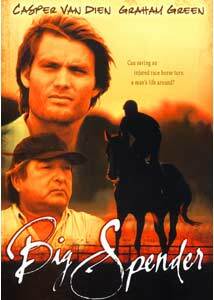 For horse lovers and boy crazy teens, Big Spender pleasantly fills the bill, but like its main character, the movie has trouble realizing its potential. As a formula family film, it checks off all the required elements, but with a little more sensitivity and finesse, it could have been affecting and memorable. Image Transfer Review: Presented in its original full screen format, Big Spender benefits from a spotless source print�largely the result of its recent release status, but appreciated nonetheless. Details remain crisp and clear throughout and the muted color palette possesses good saturation and just enough vibrancy to merit a mention. On the whole, the transfer is head and shoulders above similar made-for-TV efforts and should play nicely on any system. Audio Transfer Review: Warmth, presence and clarity distinguish the Dolby Stereo track. While directionality is virtually undetectable, the track contains enough subtleties to produce a pleasing audio field. Dialogue is always easily understood and distortion is absent, too. A good effort, and better than many TV soundtracks. Extras Review: Nothing, except chapter stops. There's no reason to spend big for Big Spender. A rental is certainly sufficient for this fair-to-middling family film. Better yet, just wait for Animal Planet to rerun it.